I made these leggings a couple of weeks ago but have only just got pictures of them. They are the Apple Peel leggings from the Pattern Magic 3 book. Pattern Magic doesn’t provide you with patterns, rather instructions for drafting your own pattern from a block. I drew up a stretch leggings block from Metric Pattern Cutting for Womwn’s Wear and used that as the basis for making the pattern. The rippled effect comes from adding length to the outer leg so that the shape of the leg ends up like this. Hence the name. 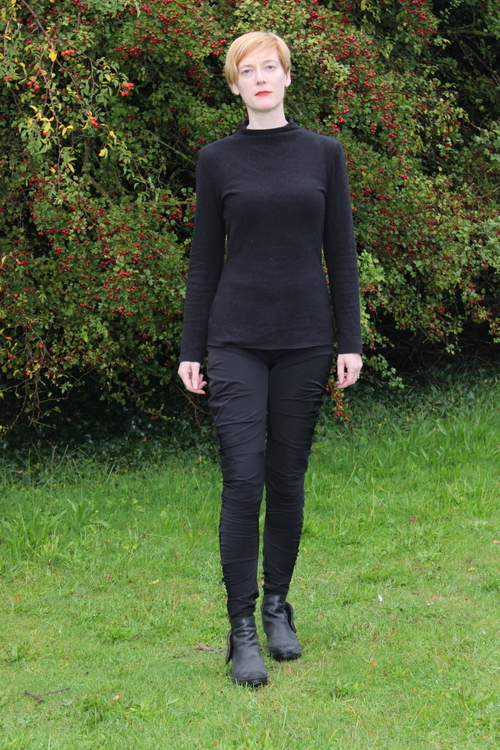 The style is obviously intended for two-way stretch knit fabrics, but mine are made up in a very stretchy mystery stretch woven fabric which I happened to have on hand. I probably should have used a knit. The draft needs fine tuning to fit my legs and the woven is less forgiving than a knit would have been. As it is, they’re more than a little tight on the calves. They’re also slightly too loose on the thigh to keep the ripples firmly in place there, but I suspect they’d become uncomfortable if I took them in. They’re very easy to make up. I did all the sewing on the overlocker in this order: inside leg seam, crotch seam, outside leg seam, waistband, hems. You can’t see it in the pictures, but the waist is finished with a straight waistband with elastic inside. The waistband folds over to enclose the elastic and then the whole thing is overlocked onto the waist. I didn’t have any wide elastic on hand so I flatlocked two narrower lengths together on the overlocker. That worked well enough from the point of view of making a functional waistband, but unfortunately the flatlocking shows though the waistband fabric so I’m only going to be able to wear these with a top that covers the waistband. I also used a flatlock stitch to do the hems. This is a finish I hadn’t tried before. I found this tutorial while I was working out how to deal with the elastic, and gave it a go. It worked OK, although being a first attempt and on a very small circumference it’s not perfectly even. However it has stood up to a couple of wears, and I wasn’t confident a twin needle hem would have lasted beyond the first try on. I’ll definitely use the technique again. Posted on September 6, 2014 September 1, 2014 by catherinedaze	This entry was posted in drafting, dressmaking, Finished, overlocker, Pattern Magic, sewing, Techniques and tagged black, drafting, dressmaking, pattern magic, sewing, trousers. Bookmark the permalink. That flatlock stitch tutorial is really interesting. I’ve seen that finish on ready-to-wear, often in a contrast thread, and I like a lot. Hmmm do I need an overlocker?? Love the leggings and is the top one of yours ‘cos I love that too! Thanks! 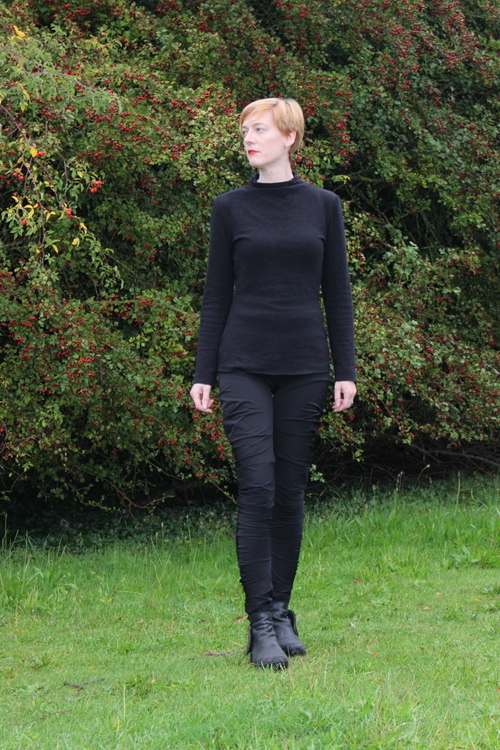 The top is an adaptation of Burda 122-04-2011 and I’ve worn it half to death, going to have to make another I think. Although next time I’ll try to get rid of that odd wrinkle above the bust that’s always there. Thanks. I do find myself adjusting them occasionally but have worn them all day a couple of times. I think some width adjustments would help as they’re too tight in some places and too baggy in others. If I had an even tension all down my leg I think they might stay put better. These are really fun! The picture of the apple peel pattern piece freaks me out though – my brain just can’t accept it! That’s a very cool effect and I never would have guessed what the pattern piece would look like! I really love these on you! So fun to see these made up and on a real person. I think they look great. Your write-up made me realize there may be an advantages to having a snug fit when there are a lot of horizontal tucks/gathers that need to stay in place. What an unusual effect. That is rather fun and different to RTW. They look good with the top too. They look pretty cool. A nice variation of a legging. I really like black on you…you’re looking totally gorgeous! Catherine. These are really cool. I’d wear them in a minute! 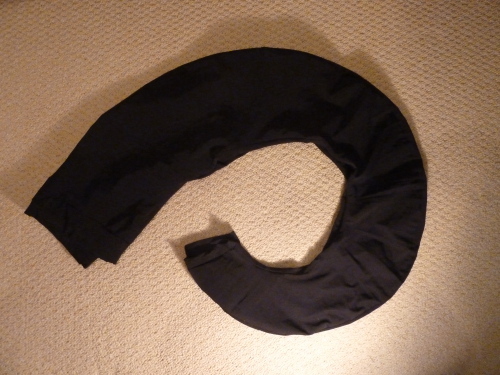 I’m a bit confused about these -are the ruches created when you pull the leggings on or have you done some sort of gathering down the side seam to hold them in place? Would love to see what they look like off! That’s the clever thing, there is no gathering and the ruching only appears when you wear them. Makes them a very quick sew. Making the pattern, not so much. But I think you already have a decent set of blocks, unlike me, so it would only be half the work as you won’t have to draft the block. Make them and show us! These leggings look great on you, and the way the ruching forms is so interesting! I find the idea of adapting blocks to make your own pattern rather than fitting an existing pattern really appealing – but making blocks that fit sounds like hard work! This is one of the few PM patterns that seems to produce a reasonably wearable garment. My own experience with her books is that it is more form than function. They are clever and inspiring but not all of them make up (not that I tried them all!) I am still struggling with the knots dress – to make something that has a nice fit as well as the knots. they look super cool! wanted to make this leggings for years, but kind of hesitated because i felt that all that ruching on the side may make my hips look way wider than they are already.. but, yours are just so fabulous looking, that i’ll have to give them a go!